Lots of people are giving their siblings DNA test kits. That’s a great idea, especially if your parents aren’t available for testing, because siblings do inherit part of the same DNA from their parents, but not all of the same DNA. That means testing siblings is a great opportunity for more genealogical matches! Recently, a friend asked me why his fraternal twin has matches to people he doesn’t, and vice versa. Great question, so let’s take a look at what to expect from matches with siblings. First, identical twins share exactly the same DNA because they are created as a result of the division of the same egg that has been fertilized by the father’s sperm. Identical twins matches should be identical. A fraternal twin is exactly the same as a sibling. Two separate sperm fertilize two separate eggs and they gestate together, at the same time. Second, let’s talk just a minute about Y and mitochondrial DNA, then we’ll discuss autosomal DNA. Y DNA Males will share exactly the same, unless a mutation occurred. Females don’t have a Y chromosome. To obtain detailed Y and mitochondrial DNA results, you’ll need to test with Family Tree DNA. They are the only vendor offering these tests. For autosomal matching, you can test with a number of vendors including: Family Tree DNA, Ancestry, 23andMe and MyHeritage. You can read more about the different kinds of testing here, and a comparison of the different tests and vendors here. Siblings share approximately 50% of the same DNA of the parents. The other 50% is different DNA that they received from the parents that the other sibling did not receive. In the conceptual example above, you can see that each child inherited 4 segments of the 8 total offered by their parents. Only two of those segments were the same for both siblings, segments 3 and 4. Of these two siblings, no one inherited parental segments 7 and 8. Perhaps a third child would. In other words, siblings can expect to see many of the same people in their match list and several that are different. In our example, the same people would be matching both siblings on segments 3 and 4. People matching child 1 but not child 2 would be matching on segments 1 and 2. People matching child 2 but not child 1 would be matching on segments 5 and 6. The reason you’ll see the same people on your match list is because you did inherit 50% of the same DNA from your parents. There are two reasons you’ll see different matches on your match lists. Some of your matches on your list that don’t match your sibling will be because the two siblings inherited different pieces of DNA from their parents. Your sibling will match people on the DNA that they received from your parents that you didn’t receive, and vice versa. Another reason for different matches is because you and your sibling will have people on both of your match lists that don’t match either parent as a result of IBC or identical by chance matching. That’s where the DNA of your match just happens to match you by virtue of zigzagging back and forth between your Mom’s and Dad’s DNA that you carry. As you can see in this example, your pink DNA came from your Mom, and blue from your Dad, but your match carries some of both values, T and A. This means they match you, but not because they match either of your parents. Just an accident of circumstance. That’s what IBC is. I wrote about matches that are identical by descent (IBD), meaning because you inherited that DNA from your parents, and identical by chance (IBC) in this article. Unfortunately, your DNA is mixed together and without other known relatives testing, it’s impossible to discern which DNA is inherited from your mother and which from your father. This is exactly why we encourage people to have known relatives test such as parents, grandparents and cousins. Who you match on which segments indicates where those segments descended from in your family tree. If one or both parents are living, that’s the best way of discerning which matches are identical by descent and which are by chance. A recent project with Philip Gammon showed by segment size the likelihood is of a match being genuine or identical by chance. If both parents have tested, he offers the free Match-Maker-Breaker tool to do this analysis for you. 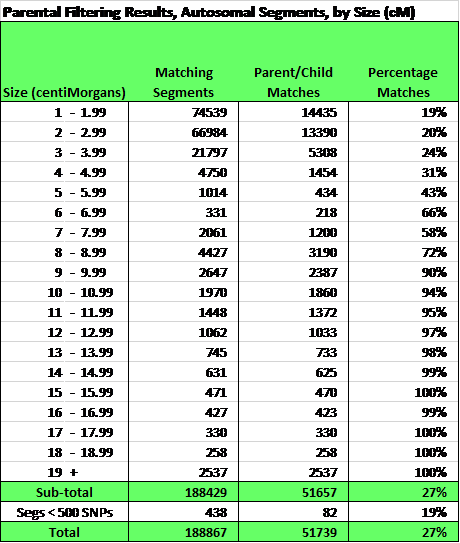 The bottom line is that when comparing your matches to those of your siblings, about 20-25% of everyone’s total matches are identical by chance, especially those at lower centiMorgan levels. The remaining 80% or so will be divided roughly half and half, meaning half will match you and a sibling both, and half will only match you. Therefore, you will be looking at roughly 40% of your matches being in common with a particular sibling, 40% not matching your sibling but being legitimate matches and the remaining 20% that are identical by chance. Of course, because you do share roughly half of the same DNA inherited from your parents, you will have some matches to both you and a sibling that are identical by chance in exactly the same way. Just finding someone on both of your match lists doesn’t guarantee that the match ISN’T identical by chance. The best way to eliminate identical by chance matching, of course, is to test your parents. Sadly, that isn’t always possible. The next best way to determine legitimate matches is to test other family members. At Family Tree DNA, they provide customers with the ability to link the DNA tests of family members to their proper location in your tree, and then Family Tree DNA utilizes the common DNA segments to determine common matching between you, that family member(s), and other people. Those people who match you and a family member on the same segment are then identified as either paternal or maternal matches, based on their position in your tree. When thinking about who to test, half-siblings, if you have any are, a wonderful way to differentiate between maternal and paternal matches. Because you and a half sibling share only one parent – which side of your tree those common matches come from is immediately evident! Of my matches at Family Tree DNA, you can see that of my total 3165 matches, 713 are paternal and 545 are maternal, with 4 being related to both sides. Don’t get too excited about those “both sides” matches, they are my descendants! Paternal and maternal bucketing is a great start in terms of identifying which matches are genealogical – and that’s before I do any actual genealogy work. All I did was test, create or upload a tree and connect tested family members to that tree. Family Tree DNA is the only vendor to offer this feature. Ethnicity is a slippery fish. I generally only consider ethnicity estimates reliable at the continental level. There are lots of reasons that siblings will receive somewhat different ethnicity results including the internal algorithms of the various vendors. You can read about what is involved in ethnicity testing here. If you test at one of the vendors, you may be able to transfer to other vendors as well as GedMatch. In the chart below, you can see which vendors accept transfers from other vendors. You can read more here. Lots of people are now testing their DNA and I hope you and your siblings will find some great matches among the new testers. The great thing about siblings, aside from the fact that they are your siblings, is that you can leverage each other’s DNA matches. Just one more way to share and move the genealogy ball forward. We’re going to do three things in this article. You must do item one above, before you can do item three…just in case you are thinking about taking a “shortcut” and jumping to three. Word to the wise. Don’t. OK, let’s get started! I promise, after we get the housework done, you’ll have a LOT of fun! Well, fun for a genetic genealogist anyway! If you haven’t updated your chromosome browser spreadsheet at Family Tree DNA since you originally downloaded your matches, it’s time to do that. You need to do this update so that your DNA Master Spreadsheet is in sync with your current matches before you can add the Family Finder bucketed matches to your master spreadsheet. Just trust me on this and understand that I found out the hard way. You don’t have to traipse through that same mud puddle because I already did and I’m warning you not to. File 1 – Your DNA Master Matches spreadsheet that you have created. This is the file you will be updating with information from the other two files, below. File 2 – A current download of all of your chromosome browser file matches. File 3 – A current download of a list of your matches. Download a new Chromosome Browser Spreadsheet, but DO NOT overwrite your existing DNA Master spreadsheet, or you’ll be swearing, guaranteed. This chromosome browser spreadsheet is downloaded from the Family Finder chromosome browser page. Label it with a date and save it as an Excel file. Download a new Matches spreadsheet. This spreadsheet is downloaded from the bottom of your matches page. Label it with the same date and save it as an Excel file too. Update your Master DNA Matches spreadsheet utilizing the instructions provided below. If you need a refresher about downloading spreadsheet information from Family Tree DNA, click here. On your Matches spreadsheet, sort the Match Date column in reverse order (sort Z to A) and print the list of matches that occurred since your last update date – meaning the date you last updated your DNA Master Spreadsheet. If you need a refresher about how to sort spreadsheets, click here. This list will be your “picklist” from the new chromosome browser match spreadsheet you downloaded. I removed the middle and last names the matches, above, to protect their privacy, but you’ll have their full name to work with. After your spreadsheet is sorted by match date, with the most current date at the top, you’ll have a list of the most recent matches, meaning those that happened since your last file download/update. Remember, I told you to record on a secondary page in your DNA Master Spreadsheet the history of the file, including the date you do things? This is why. You need to know when you last downloaded your matches so that you don’t duplicate existing matches in your spreadsheet. Why don’t you just want to download a new spreadsheet and start over? Remember the color coding and those pink columns we’ve been adding, at right, above, so you can indicate which side that match is from, if the segment is triangulated, how you are related, the most recent common ancestor, the ancestral line, and other notes? If you overwrite your current DNA Master spreadsheet, all of that research information will be gone and you’ll have to start over. So as inconvenient as it is, you’ll need to go to the trouble of adding only your new matches to your DNA Master spreadsheet and only add new matches. Utilizing the new Chromosome Browser match spreadsheet, you are going to scroll down (or Ctl+F) and find the names of the people you want to add to your master spreadsheet. Those are the people on your Matches spreadsheet whose test date is since you last downloaded the chromosome browser information. When you find the person’s name (Amy in this example) on the Chromosome Browser Match spreadsheet, highlight the cells and right click to copy the contents of those cells so that you can paste them at the bottom of your DNA Master Spreadsheet. Next, open your Master DNA Spreadsheet, and right click to paste the cells at the very bottom of the spreadsheet, positioning the cursor in the first cell of the first row where you want to paste, shown below. Then click on Paste to paste the cells. Repeat this process for every new match, copy/pasting all of their information into your DNA Master Spreadsheet. I try to remember to do this about once a month. Housekeeping note – If you’re wondering why some graphics in this article are the spreadsheet itself, and some are pictures of my screen (taken with my handy iPhone,) like the example above, it’s because when you do a screen capture, the screen capture action removes the drop down box that I want you to see in the pictures above. Yes, I know these pictures aren’t wonderful – but they are sufficient for you to see what I’m doing and that’s the goal. In my case, if you recall, I have a combined master spreadsheet with my matches and my mother’s matches in one spreadsheet. You may have this same situation with parents and grandparents or your full siblings if your parents are missing. You will need to repeat this process for each family member whose entire match list resides in your DNA Master spreadsheet. I know, I groaned too. And just in case you’re wondering, I’ve commenced begging at Family Tree DNA for a download by date function – but apparently I did not commence begging soon enough, because as of the date of this article, it hasn’t happened yet – although I’m hopeful, very hopeful. After your spreadsheet is updated, we have a short one-time housekeeping assignment, then we’ll move on to something much more fun. I want you to add the following segments into your DNA Master spreadsheet. These are known pileup regions in the human genome, also known as excess IBD (identical by descent) regions. This means that you may well phase against your parents, but the match is not necessarily genealogical in nature, because many individuals match in these areas, by virtue of being human. Having said that, close relationships may match you in these regions. Hopefully they will also match you in other regions as well, because it’s very difficult to tell if matches in these regions are by virtue of descent genealogically or because so many people match in these regions by virtue of being human. You can color code these rows in your spreadsheet so you will notice them. If you do, be sure to use a color that you’re not using for something else. I have used several sources for this information, including the ISOGG wiki phasing page and Sue Griffith’s great Genealogy Junkie blog article titled Chromosome Maps Showing Centromeres, Excess IBD Regions and HLA Region. The HLA region on chromosome 6 is the most pronounced. Tim Janzen states that he has seen as many as 2000 SNP segments in this region that are identical by population, or at least they do not appear to be identical by descent, meaning he cannot find the common ancestor. His personal HLA region boundaries are a bit larger too, from 25,000,000 to 35,000,000. Regardless of the exact boundaries that you use, be aware of this very “matchy” region when you are evaluating your matches. This is exactly why you’re entering these into your DNA Master spreadsheet – so you don’t have to “remember.”. By the way, Family Tree DNA and GedMatch use Build 36, but eventually they will move to Build 37 of the human genome, so you might as well enter this information now so it will be there when you need it. If your next question is about how that transition will be handled, the answer is that I don’t know, and we will deal with it at that time. I do not enter the SNP poor regions, because Family Tree DNA does not utilize those regions at all, and they are the greyed out regions of your chromosome map, shown below. On my own spreadsheet, I have a few other things too. I have indicated chromosomal regions where I carry minority ancestry. For both my mother and me, chromosome 2 has significant Native admixture. This Native heritage is also confirmed by mitochondrial and Y DNA tests on relevant family members. If you carry any Native American or other minority admixture, where minority is defined as not your majority ethnicity, as determined by any of the testing companies, you can utilize GedMatch ethnicity tools to isolate the segments where your specific admixture occurs. I described how to do this here as part of The Autosomal Me series. I would suggest that you use multiple tools and look for areas that consistently show with that same minority admixture in all or at least most of the tools. Note that some tools are focused towards a specific ethnicity and omit others, so avoid those tools if the ethnicity you seek is not in line with the goals of that specific tool. Ok, now that our housekeeping is done, we can have fun. I love the new Family Tree DNA phased Family Finder matches that assign maternal or paternal “sides” to matches based on your matches to either a parent or close relative. If you would like a refresher on parental phasing, click here. We’re going to utilize that Match spreadsheet you just downloaded once again. In this case, we’re going to do something a bit different. I delete the N/A rows, which means “not applicable” – in other words, the match did not meet the criterial to be assigned to a “side.” You can read about the criteria for phased Family Finder matches here and here. If you don’t want to delete these rows, you can just ignore them. In this case, you can highlight either the entire column or just the column heading, and right click to insert an entire column to the left. If these are your matches, add your name in the “Who” column. If these are your parents’ or full siblings’ matches, add their names in this column. When you have a combined spreadsheet, it’s critical to know whose matches are whose. Then select colors for the maternal, paternal and both buckets, and color the rows on your spreadsheet accordingly. I use pink and blue, appropriately, but not exactly the same pink and blue I use for the mother and father spreadsheet rows in my DNA Master spreadsheet. I used a slightly darker pink and slightly darker blue so I can see the difference at a glance. The yellow, or gold in this case, indicates a match to both sides. You’re only going to actually utilize the first two columns of information. Highlight and copy the first two columns, without the header, as shown below. Then open your master spreadsheet and paste this information at the very bottom of your spreadsheet in the first two columns. After the paste, your spreadsheet will look like this. Next, sort your spreadsheet by match name, this case, RVH is the match (white row). Be still my heart. Look what happens. By color, you can see who matches you on which sides, for those who are assigned to parental buckets. Now my white RVH match row is accompanied by a gold row as well telling me that RVH matches me on both my maternal and paternal sides. Let’s look at another example. In the case of Cheryl, she is my mother’s first cousin. Since I have combined both my mother’s and my spreadsheets, you can see that Cheryl matches both me and my mother on chromosome 19 and 20 below. Mother’s match rows are pink and my rows are white. In this example, you can see that indeed, Cheryl is assigned on my maternal side by Family Tree DNA, based on the dark pink match row that we just added. Indeed, by looking at the spreadsheet itself, you can confirm that Cheryl is a match on my mother’s side. I am only showing chromosome 19 and 20 as examples, but we match on several different locations. I don’t have as many paternal side matches, because my father is not in the system, but I do have several cousins to phase against. Here’s my cousin, Buster, assigned paternally, which is accurate. In Buster’s case, I already have him assigned on my Dad’s side, but if I hadn’t already made this assignment, I could make that with confidence now, based on Family Tree DNA’s assignment. The blessing here is that the usefulness of Buster’s assignment paternally doesn’t end there, but his results, and mine, together will be used to assign other matches to buckets as well. Cousin matching is the gift that keeps on giving. Because my DNA Master spreadsheet includes my mother’s information as well, we need to add her phased Family Finder matches too. Continue with the same “Adding Phased Family Finder Matches” instructions above, and when you are finished, you will have a Master DNA Spreadsheet that includes your information, your parent’s information, and anyone who is phased for either of you maternally, paternally or to both sides will be noted in your spreadsheet by match and color coded as well. Let’s take a look at cousin Cheryl’s matches to both mother and I on our spreadsheet now with our maternal and paternal buckets assigned. As you can see, my results are the white row, and my Family Finder phased matches indicate that Cheryl is a match on my mother’s side, which is accurate. Looking at my mother, Barbara’s matches, the pink rows, and then at Barbara’s Family Finder phased match information, it shows us that Cheryl matches mother on the blue, or paternal side, which is also accurate, per the pedigree chart below. You can see that Barbara and Cheryl are in the same generation, first cousins, and Barbara matches Cheryl on her paternal line which is reflected in the Family Finder bucketing. I have updated the “Side” column to reflect the Family Finder bucketing information, although in this case, I already had the sides assigned based on previous family knowledge. I find this combined spreadsheet with the color coding very visual and easy to follow. Better yet, when other people match mother, Cheryl and I on this same segment, they fall right into this grouping on my DNA Master spreadsheet, so the relationship is impossible to miss. That’s the beauty of a combined spreadsheet. Why not half siblings or half aunts-uncles? Those people have DNA from someone who is not your ancestor. In other words, your half siblings have the DNA from only one of your parents, and you don’t want their matches from their other parent in your spreadsheet. You only want matches that positively descend from your ancestors. While your grandparents, great-aunts, great-uncles, parents, aunts and uncles will have matches that you don’t, those matches may be critically important to you, because they have DNA from your ancestors that you didn’t inherit. So your combined DNA Master spreadsheet represents your DNA and the DNA of your ancestors found in your relatives who descend directly ONLY from your ancestors. Those relatives have DNA from your ancestors that has washed out by the time it gets to you. Why can’t your cousins be included in your DNA Master spreadsheet? I want you to take a minute and think about the answer to this question. If you answered, “Because my aunt or uncle married someone with whom they had children, so my cousins have DNA that is not from an ancestor of mine,” you would be exactly right!!! The great news is that between a combined spreadsheet and the new Family Finder bucketed matches, you can determine a huge amount about your matches. After discovering which matches are bucketed, you can then use the other tools at Family Tree DNA, like “in common with” to see who else matches you and your match. The difference between bucketing and ICW is that bucketing means that you match that person (and one of your proven relatives who has DNA tested) on the same segment(s) above the 9cM bucketing threshold. You can still match on the same segments, but not be reported as a bucketed match because the segments fall below the threshold. “In common with” means that you both match someone else, but not necessarily on the same segments. Here’s a nice article about utilizing the 9 tools provided by Family Tree DNA for autosomal matching. The absolutely wonderful aspect of phased Family Finder Matching is that while you do need to know some third cousins or closer, and the more the better, who have DNA tested, you do NOT need access to their family information, their tree or the DNA of your matches. If your matches provide that information, that’s wonderful, but your DNA plus that of your known relatives linked to your tree is doing the heavy lifting for you. How well does this really work? Let’s take a look and see. On the chart below, I’ve “bucketed” my information (pardon the pun.) Keep in mind that I do have my mother’s autosomal DNA, but not my fathers. His side is represented by 8 more distant relatives, the closest of which are my half-sister’s granddaughter and my father’s brother’s granddaughter – both of which are the genetic equivalent of 1st cousins once removed. My mother’s side is represented by mother and two first cousins. Mother has the above 106 paternal bucketed matches without me doing anything at all except linking the DNA tests of mother to her two first cousins in her tree. In my case, the combination of mother’s DNA and her two first cousins generated 356 maternal side bucketed matches, just by linking mother and her two first cousins to my tree. Mother does have one third cousin on her mother’s side who generated 13 maternal bucketed matches. So, while third cousins are distant, they can be very useful in terms of bucketed “sides” to matches. It’s ironic that even though I have my mother’s DNA tested, I have slightly more paternal matches, without my father, than maternal matches, with my mother. Of course, in my case, that is at least partly a result of the fact that my mother has so many fewer matches herself due to her very recent old world heritage on several lines. Don’t think though, for one minute, that you have to have parents or siblings tested for Family Finder bucketed matching to be useful. You don’t. Even second and third cousins are useful and generate bucketed maternal and paternal matches. My 361 paternal matches, all generated from 8 cousins, are testimony to that fact. The very best thing you can do for yourself is to test the following relatives that will be used to assign your resulting matches with other people to maternal and paternal sides. The new permanent price of $79 for the Family Finder test will hopefully encourage people to test as many family members as they can find! For autosomal genetic genealogy, it’s absolutely the best gift you can give yourself – after testing yourself of course. Family Tree DNA has been rolling out updates and upgrades fast and furious. Half “other relatives” such as aunts, uncles, first cousins, etc. I’m certainly envious of anyone who can test their great-grandmother – although my grandchildren have their great-grandmother, grandmother and both parents in the system. In my case, before this change, the only relative that I had in the system that originally qualified was my mother. I was very excited to have people in my maternal bucket and was wishing for people in my paternal bucket. I do have several cousins who have tested on my paternal side, but none as close as 1st cousins. Imagine my delight when I signed on to my account and discovered 359 individuals in my paternal bucket and one in both, in addition to my 256 maternal phased matches. Of course, now I’m searching through my DNA matches to see if I have anyone else who qualifies that has tested. And I’m thinking about any other cousins that would benefit my phased parental bucket assignments if I were to be able to convince them to test. I unlinked and relinked a few people to see how many people were added to the buckets because of them. The second cousin once removed added 12 new people. Yet, one of the third cousins added 82, so you really never know. Some of the people who might have been added to a bucket by the second cousin may have already been added to the parental bucket by an earlier match. Regardless, the more people linked to your tree from third cousins closer, the better your chances for having people assigned to maternal and paternal sides of your tree, even without having your parents. Keep linking people in your tree when you know where and how they connect to you – regardless of where they are located in your tree. You never know how that may benefit you – which morning you may wake up and find additional information or more people in your buckets. What a great surprise!!! This is a pretty amazing feat if you think about it, given that just a few years ago autosomal testing wasn’t available at all, and even today, no other vendor does phased matching, assigning individuals to maternal or paternal buckets utilizing parents and other relatives when parents aren’t available.